There is nothing in particular on my list for next year. I would still like to get something from Maciej Kopciuch, but have nothing specific in mind. A bronze sword from Neil Burridge had been on my yearly list for some time, but I never got around to it until this year - a Ewart Park. This is a beautiful piece, made by the premier bronze sword maker in the world. If you have any interest in weapons from this era, I strongly recommend his work. I wanted to get at least one more sword from Gus Trim, and sprang for a short Type Xa with a 23 inch blade. This is a fine little sword, light, fast, and good looking. ATrim Shorties are rare, and I wanted to get one. I was curious about the Kingston Tourney Blunts, so I sprang for their hand-and-a-half. Unfortunately, it is badly designed and balanced, and handles like a clunker. The blade is too short at just under 33 inches, and the grip is too short for a comfortable two handed grip at 6 inches. I was curious about Castille Armory, so I got a Venetian style side sword from them. this sword handles well, and could look quite good, except it has a finger ring that is at least twice the size that it should be, which ruins the look of the sword. These days I can't buy anything new unless I sell things I've already had. 2017 saw me sell several pieces privately and other things. From that perspective, it was a good year. In 2018, I'll be getting a hilt from EB Erickson and I'll be getting a completed sword back from A&A that is based on a hilt received by EB Erickson a couple years ago. I'll also be selling more. The collection will be shrinking considerably but I'll still hold onto some really good stuff so I'm happy about it. They are all good for different reasons. To make room I gave up Albion Jarl, Albion Vigil, and A&A St. Maurice. Moving forward, I've been watching quite a while for an Albion Squire for sale, but recently gave up and ordered one. Hopefully that will come in 2018. And currently I'm trying to sell off a couple of custom pieces to make room for more...something Viking probably. I generally get inspired to get something Viking when the new TV season of 'Vikings' begins. Maybe more Rob Miller. Might need to sell a couple of things in the ebb and flow. Trying something else from Europe. I'd really like to stumble into a Ringeck or Fiore or Durer! Have a bit of an itch for and axe or pole weapon. Probably going to get a buckler or two and some soft kit. Maybe targets of opportunity! I didn't really score much to talk about this year...a couple of books, a Cold Steel Viking axe and Gladius machete, a few pieces of armor, and a 14th c. great helm. I got a hanwei 9th century viking this year(my first sword). The blade on this sword is quite good, but i am thinking about rehilting this one with a petersen type h pommel, as the pommel and guard are made out of stainless steel, and they are a bit off center. Next year i am thinking about getting a half riveted half solid mail hauberk, and a nasal helmet. I didn't buy much in 2017, but I started work on making my higher class 15th C clothing for medieval reenactment, my joined hose are just about finished, just the doublet and cote to make then. I'm planning on selling my old hanwei arming sword, it's been a good workhorse for training and sparring and the old hanwei's from before the factory burned down were built like tanks, but it's weighty and I've recently had my interest turned to messers so I'm selling it on to make room for a new Langemesser from Armory Marek and possibly one of his montantes. In 2018 I'm also looking to commission a Burgundian style breastplate from Armour Services Historical in the UK and in general try to build more on my level of armour. Full intention is to have a mish mash composite harness in the end. I didn't buy much in 2017, but I started work on making my higher class clothing for medieval reenactment, my joined hose are just about finished, just the doublet and cote to make then. I understand the pain, been staring at my fabric for half a year trying to will myself to make the things, but just seeing how the colours come together now the hose are nearly finished makes me want to finish the whole project. Sword-wise this year, I picked up an Albion Crecy and a Regenyei museum replica feder (based on the example in Zurich). Both are wonderful tools. 2018 is unlikely to feature any new sharps, but is probably going to have either a new dedicated blunt (Albion Liechtenauer, or a custom job from Castille, probably) or a new feder for hard sparring (custom from Regenyei). And possibly a smallsword. I haven't bought a new sword in a long time. The new Arms & Armor items are very tempting. Of course I'll have to sell something to make space. Well, the highlight of this year and of my collection is undoubtably an Albion Knecht that took me well over a year to get, but was soooo worth the wait. 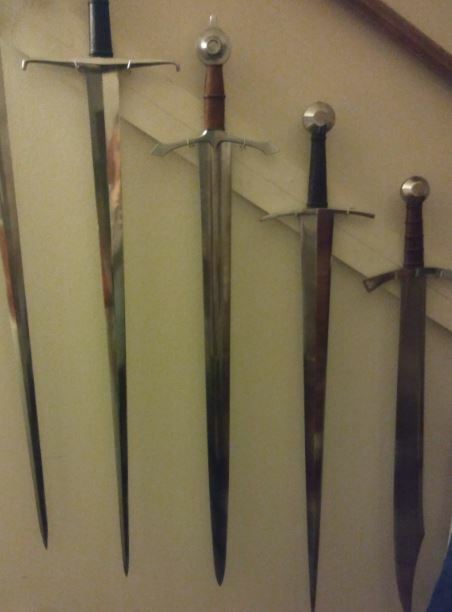 Other than that, I got allot of Blackfencer trainers from SouthCoastSwords for my club this year, and I also got a one off saber-style messer from Landsknecht Emporium just last week. I also have a Chlebowski feder on the way from HEMA supplies. Over the next year I hope to continue my messer obsession by getting an Albion Soldat and then some Blackfencer Greatswords and probably some manner of pollaxe and staff trainers. If I can manage to muster the funds after those, I'd really like an Albion Earl and Maximilian. Overall it's been the most eventful year yet for my collection, and I'm really looking forward to next year. No new swords or other arms this year (I don't count the tiny little belt knife as a weapon). Next year I want to sell off my Hanwei side-sword and get a military smallsword-style hanger, either this one, or one of M. Ledoyen's French infantry swords, or this one from Godwin. This year I got the Viceroy from Albion, which is everything I hoped it would be and then some. I also got both of the 15th century eating sets from the English Cutler. I had hoped this would satisfy my curiosity for non-weapon historical kit, but instead now I'm eagerly awaiting the re-launch of Tod's Workshop and Tod Cutler. For 2018, I have an Albion Prince on order. So J.D. won't be the only one getting one of those sweet Albion XVIs. I'm also in Brian Kunz's queue for a scabbard for the Viceroy. I'm excited to see what he does about that ricasso. And currently I'm trying to sell off a couple of custom pieces to make room for more...something Viking probably. Update: those items sold so I purchased a Huskarl that KoH had in stock. That's #6 this year. Don't hate me!!! By the way, last time I checked KoH also had a Jarl in stock. Nice Xmas gift for someone. I received my Albion Laird earlier this week. It was purchased through Kult of Athena, which was done primarily because of the customer service level (and the discounted price doesn't hurt either). They kept me apprised of the status and then notified me upon completion. I'm pretty sure I ordered it around the middle of February, and so it was about 10 months from order date to delivery. This was a very happy surprise considering Albion's backlog. I very much like the elegance of simplicity in many of the Albion models. Conversely, the Laird is a stark contrast to some of my favorite swords. Most medieval swords appeal to me as generic "western European medieval swords" that would not be out of place in any part of western Europe. And not representative of specific location in the way we typify armour, such as a helmet in an English, Milanese or Germanic style. But with the Laird, I feel I can confidently refer to it as "my Scottish sword". Like many of you, I have an affinity for the Albion swords. And I have a personal goal to own one of each of Oakeshott's blade classifications from XII to XVII including each subclass. I still do not own an XVI or XVIa. So after the holiday, I will probably place an order the Prince or Crecy. This weekend I intend to work on a scabbard core for the Laird. I still have scabbards for the Vassal and Baron that I have only finished the wood cores on. To help motivate myself, I have given myself the requirement of finishing the scabbards for swords I have before I order anything else.